Winter officially begins on Dec. 21 this year, but depending on where you live, true winter weather conditions can begin well before this date or even after it passes. 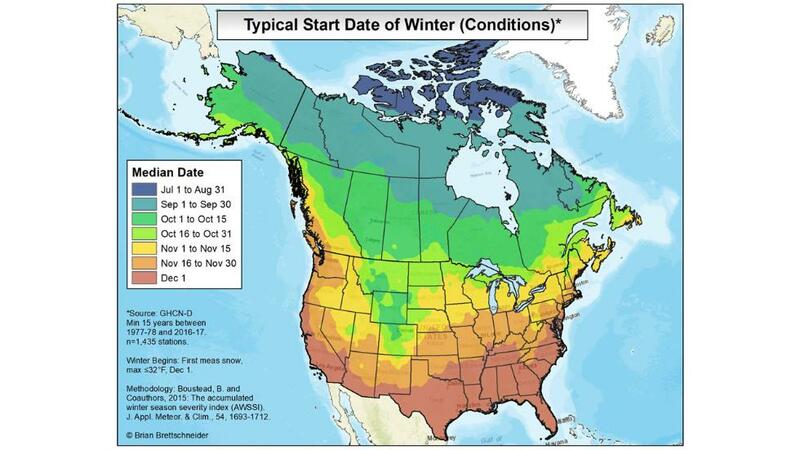 Climatologist Dr. Brian Brettschneider of the University of Alaska-Fairbanks compiled the map below which captures the median date for when the first winter weather conditions of the season have historically arrived in the United States and Canada. Brettschneider used an index called the Accumulated Winter Season Severity Index (AWSSI) to create the map using weather data over the past 40 years. For any given location, the start date of the winter, based on the AWSSI, is defined as when the first measurable snowfall (0.1 inches or greater) occurs, or when the first high temperature 32 degrees or lower is recorded. The start date is Dec. 1 for any location that does not see either prior to that date. As you would expect, the median date when northern climates historically see their first measurable snow or high temperature 32 degrees or lower is before winter officially begins. For parts of northern Canada and Alaska, the median date is long before the official start of winter, occurring in September or even earlier. Farther south, the median date for the arrival of the first winter weather conditions of the season is before Dec. 1 in a swath from the Northeast westward through the Midwest and into parts of the Rockies and Northwest. Winter starts Dec. 1 in much of the South, based on the AWSSI index criteria, since the median date of the first measurable snow or first high temperature 32 degrees or lower is after that date. In some years, parts of the South never see measurable snow or a high temperature 32 degrees or lower. During the course of the winter season, the AWSSI tracks the severity of winter weather conditions in real-time for several cities across the U.S.
"The categories are site-specific... because what constitutes a severe winter, say, in Washington D.C. or Atlanta would be considered mild in Chicago or Minneapolis," said Dr. Barbara Mayes Boustead, co-creator of AWSSI and a forecaster at the National Weather Service in Omaha, Nebraska. The index takes into account the "intensity and persistence of cold weather, the frequency and amount of snow and the amount and persistence of snow on the ground," said the Midwest Regional Climate Center. Wind and mixed precipitation, such as freezing rain, are not a part of the index. The index uses five categories – mild, moderate and average to severe and extreme – to rate the severity of winter weather at any given point in the season. You can track the AWSSI during the winter ahead at this link.